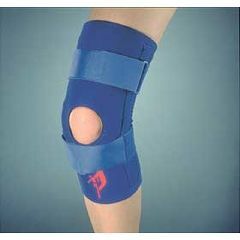 Palumbo Universal Knee Brace with Buttress Pad reduces stress on the patello-femoral joint. Features sewn-in, horseshoe-shaped, rubber buttress pad. D-ring straps control migration. Neoprene. One piece. Not adjustable. Sizing: Measure circumference 3" above mid-patella and 3" below mid-patella.